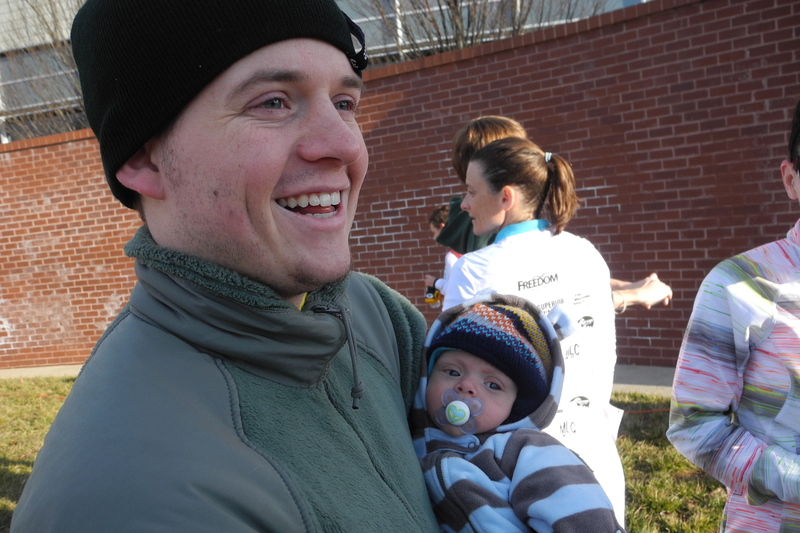 Yesterday I ran my first race of 2013 – the Frozen 5K. I was excited for this race because: 1) It kicked off my goal of running one race every month in 2013, 2) I had a bunch of friends running it, and 3) I wanted redemption from last week’s disappointing race. Luckily I have the world’s most supportive husband, who doesn’t mind getting up early to go to all these races with me! We got to the race shortly before the 8:30 a.m. start. I had just enough time to grab my bib and shirt, say hi to friends, run to the bathroom, and give both my Kevins a kiss before going to line up. I knew this was a flat course entirely on road (unlike last week’s difficult rocky course) so I decided to really push it and see what I could do. My previous 5K PR was 23:07 from October 2011, which was way before baby. I didn’t know if I would be able to beat that but I wanted to try. I knew I’d have to go for about a 7:30 pace, so I decided to push myself and hang on as long as I could. I went to line up and found 3 of my friends near the back. We started talking and then all of a sudden, it was time to run! I realized quickly that I probably should have started close to the front because I wasted a lot of time and energy trying to get past people. Eventually I found a clear stretch of road and settled into a nice pace. I ran my first mile in 7:25 and was feeling good. Just like the name of the race, the temperature was just below freezing during the race. My body was pretty warm, but at the last minute I threw my gloves to Kevin before starting thinking I wouldn’t need them. My hands ended up being numb and freezing the entire time. I also felt the chill in the air every time I breathed in deep. It hurt my throat and made it difficult to breathe at times. I know as I run outside more often I’ll get used to this, but it slowed me down a bit during mile 2. I ran my second mile in 7:35. I was able to see my friends on some of the out and back sections of the course, but I was really started feeling the fatigue at this point. I really had to focus through mile 3. I couldn’t maintain the same pace and I started to feel a stomach cramp and nausea coming on. I wanted to walk so badly but kept telling myself I would be done in less than 10 minutes. I ran that third mile in 7:45. I knew I was going to be really close to my PR and probably wouldn’t make it, but I somehow found the strength to sprint the last tenth of a mile. My pace dropped below 7 minutes in that final stretch and I crossed the finish line in 23:16. So, so close! I barely noticed Kevin taking these pictures because I was in the zone. After I finished I got some water and leaned against the wall for a few minutes trying to catch my breath. Once I recovered I went to find Kevin at the finish line and we waited for the rest of our friends to cross. First up was Cameron, our friend’s daughter who is super speedy and way more athletic than I will ever be! Then came Amanda, who got a PR! She is joining me and running a race every month in 2013 as well. After Amanda came Gina, who was my Body Pump instructor before I moved to a new town. She actually ran a race every month last year and was the inspiration for my goal this year! Then came Darla and Danielle! It was Darla’s birthday and even though she has run a couple of half marathons, she had never done a 5K before (she is very ambitious!). 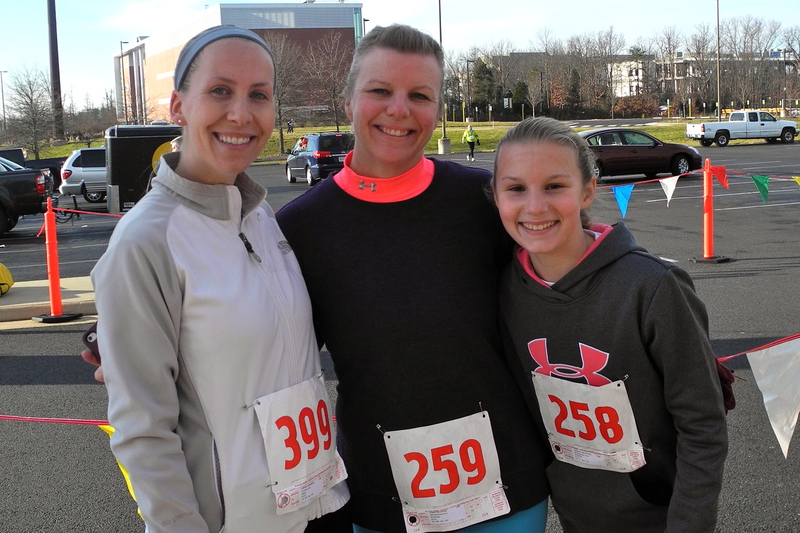 She thought running her first 5K would be a great way to spend her birthday. I agree 🙂 Danielle is another friend of mine who is running a race every month. She’s actually already doing it, and has run a race each month since July last year! Once everyone had finished we hung out for a bit and took some celebratory photos together. Then we headed inside to check our times and warm up. With Gina, who got me hooked on Body Pump! Once we got inside I was shocked to discover that I had won second place in my age group (25-29). I have placed a couple of times in my age group when there were only 3 or 4 people in it (haha! ), but this time I was 2nd out of 31! I was so excited! Even though it wasn’t a PR for me I couldn’t be happier with my performance and results in this race. Running fast is NOT natural for me. It is really, really hard. But over the years I’ve learned how to become more comfortable with feeling UNcomfortable and pushing my pace. It felt good to finish the race knowing I used everything in my tank and truly did my best. It was a huge bonus too that my knee didn’t hurt at all during or after the race. 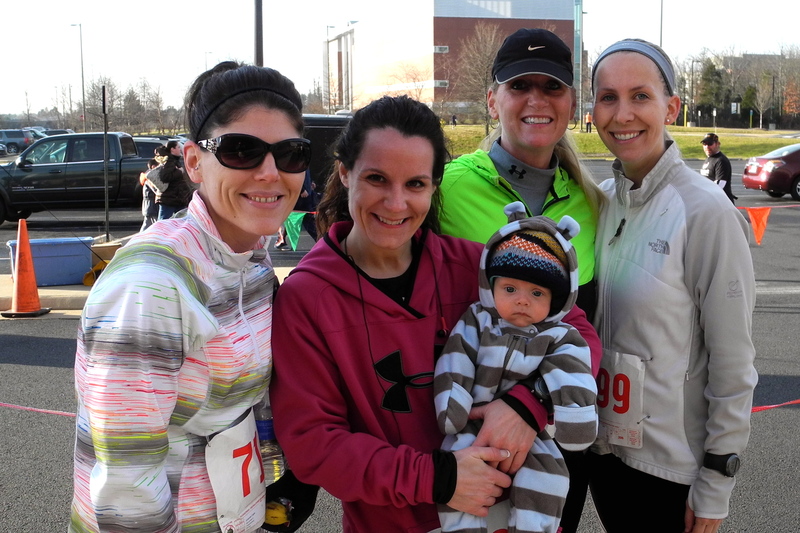 I’m slowly coming back to where I was pre-pregnancy, and I can’t wait to see how the rest of my 2013 races go! 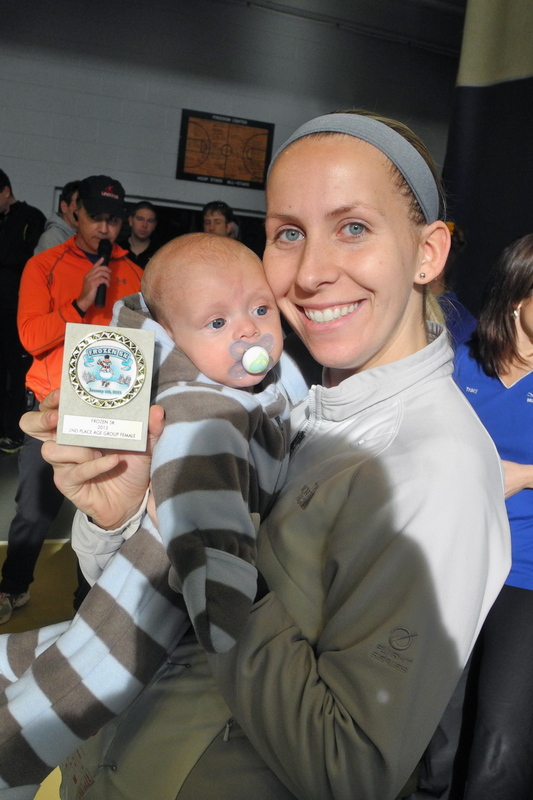 This entry was posted in Uncategorized and tagged Baby K, Family, Friends, Kevin, Post Partum, Races, Running. Bookmark the permalink. Nice run!! That award is super cute.